Clamping wood for gluing is the gold standard for getting a tight, even fit. Master woodworkers claim a good joint won’t even need glue — but in the real world, sometimes it’s a necessity. Clamping isn’t always possible or practical, however. Some projects are just too fragile for even the most delicate of clamps and some are too bulky, awkwardly-shaped or unwieldy. A little ingenuity and creative thinking can help you successfully glue your woodworking projects without the use of clamps, though it can help to have some ideas to use as starting points. A well-fitted joint should need very little extra support as you apply glue. Masking tape or other easy to remove, non-marking tape – such as blue painter’s tape – can provide that support to keep the piece in place until the glue dries. Tape works especially well on more fragile wood projects like those made from balsa wood. Delicate woods where the pressure of a clamp would damage the wood itself can also benefit from masking tape as a gluing aide. You can remove the tape easily without worrying about damage to your project when you’re done. If you’ve got a large, bulky project that a clamp might never fit around, consider using bungee cords to secure joints as you glue. Bungee cords come in all manner of lengths and strengths, meaning you’re almost guaranteed to find something that works. Applying proper tension to keep joints held securely can be tricky, as you may not want to secure them directly to your project but to a spot on your workbench or in your space instead. Experiment with placement and tension for the best hold before settling on a configuration for aiding in the gluing of your project. Just take care not to glue the cord to your project. If you’re feeling inventive and have some rope and sticks laying around, you can apply pressure using a windlass — basically rope, twine or anything else string-like wound around two sticks set at opposing points. Then, using another stick as a lever, twisting the rope to tighten it. This allows you to have complete control of the pressure placed on the join and vary it based on your needs. It’s quick to set up, most people have the supplies laying around, and is quick to take down when you’re done. Similar to tape, if you need something disposable and easy to glue a small project without a clamp, go ahead and stick some thick rubber bands on it. They’re no fuss, they’re found at the bottom of any desk drawer or are readily available at an office supply store and they’re cheap. Cut them off when you’re done without worrying about damaging your finished project. Although clamps are ideal for gluing woodworking projects, they aren’t always available or practical for all projects. Get creative when you have a project to glue that you can’t clamp. 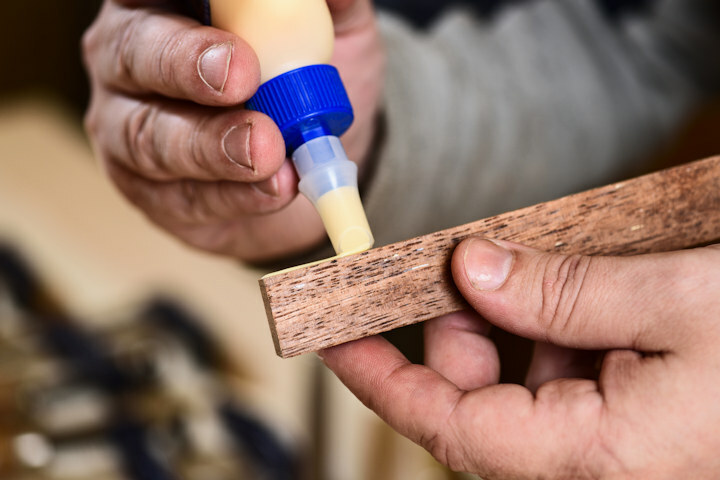 Think outside the box, so to speak, and look around for tools and supplies you have on hand to help you apply the minimal amount of pressure needed to keep joints in place as your wood glue dries. Look around your workshop or garage to see if you have any solutions that may help you steady your glued project until it’s dry. Have you ever glued a project without a clamp? How did it turn out? What, if anything, did you use to steady the joint? Left out one old method. A rubbed joint. I made a stool with cabriole legs that require the addition of a knee block. With all the curves involved clamping is not an option. Just rub the parts with glue applied that are long grain to long grain together until they slide with difficulty. Position them and leave them alone. The stool I mentioned was made 42 years ago. It is still holding. I use a leather belt, I have punch holes all along the leather so I can get down to around 8inch 200mm with the size buckle that is on the belt. i don’t know what world you live in but a calm is a devise used to apply pressure from one thing to an other. suggested a change in name to alternative ways to clamp. have used all your methods and some, any new methods will be welcomed learning never goes out of style. A rubbed joint works well for short straight pieces. Triangular blocks on the bottom of a drawer. I often use weights, bottles filled with sand. Or, clamp without a clamp; when you don’t have a clamp to fit your work is to create a fixture (plywood or a straight & flat piece of lumber) that your work can fit inside of, add a block at each end and use a wedge to apply pressure between one of the blocks and your work. When I used to repair chairs, especially spindled legs that splay outward, i used surgical tubing. It stretches with lots of pressure on joints and ending with an overlap. Knots are not necessary. It wraps easily around any surface. I kept all different diameters in stock, depending on how much pressure i needed. You must use long pieces that will completely wrap around the all 4 legs. If you cheap out with several small sections, you will be wasting your time.